Read Juliana Smith's Dope '(H)afrocentric,' A "Feminist Version of 'Boondocks'"
It's biting, hilarious and true. And she is, in her comic (H)afrocentric. The title is a portmanteau of half and afrocentric, and refers to the series’ main character, the half black, half white revolutionary-hopeful Naima Pepper. A student at Oakland’s (fortunately fictional) Ronald Reagan University, Pepper struggles to affect social change while dealing with all of the anxieties of being a collegiate millennial. Another key influence was The Real Cost of Prisons Comix. Smith assigned the book for a class she was teaching at Oakland’s Laney College. 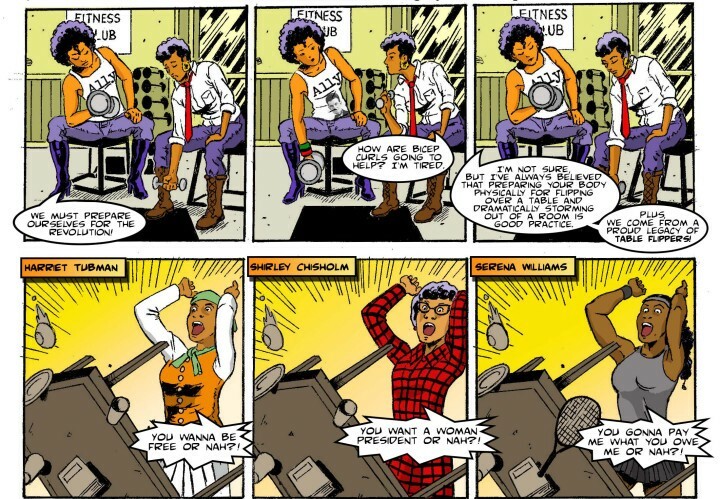 Surprised with how fully her students engaged with the text, Smith realized that comics could be the perfect medium through which she could advance her own ideas about social justice. To that end, she teamed up with illustrator Ronald Nelson and colorist/letter Mike Hampton. Smith and her team have recently finished the fourth graphic novel installment of Naima Pepper’s adventures. And, you can now follow Naima and her colorful cast of friends weekly on The Establishment.